Mel Gibson wrote, produced, and directed the Passion of the Christ. He produced a scene showing a close up of the Roman executioner’s hand holding a spike and a mallet as he nails the hand of Jesus to the cross. Mel Gibson shot this scene using his own hands as the Roman’s hands, nailing Jesus to the cross. He said that he wanted to do that because it was indeed his own hands that nailed Jesus to the cross. Did the Romans kill Jesus? Yes. Did I kill Jesus? Yes!!! Did you kill Jesus? Yes!!! Jesus provided the greatest substitution ever known. He took our place when he died on the cross! My dear children, I write this to you so that you will not sin. But if anybody does sin, we have one who speaks to the Father in our defense — Jesus Christ, the Righteous One. He is the atoning sacrifice (or, propitiation) for our sins, and not only for ours but also for the sins of the whole world. This is love: not that we loved God, but that he loved us and sent his Son as an atoning sacrifice (propitiation) for our sins. Jesus Christ did not just make satisfaction for our sins, though He did that. He is the satisfaction Himself. The Septuagint translators used the same Greek word translated "propitiation" here (hilasmos, satisfaction, cf. 4:10) to translate the "mercy seat" on the ark of the covenant. Jesus' body was the site where God placated His wrath against sin. Verses 1:5—2:2 all have Old Testament tabernacle connotations. Jesus' death not only expiated (cleansed) sins, but it satisfied God's wrath against sin. 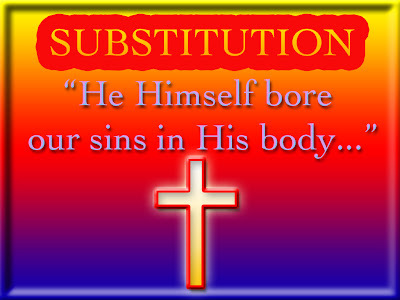 As part of being our substitute, Christ took our sins away from us and carried them on himself. The wrath of God which is aways directed at sin, was turned away from us and turned toward the one who carried our sin. Like a missile locked in on the target of sin, God’s wrath and judgement (death) was heading straight for the target of sin in our lives. Jesus snatched the target off of us and put it on himself (1peter 2:24). The trajectory of God's wrath changed to match the location of sin. God took out all of his anger against sin on the physical body of Jesus, while Jesus carried all of our sins and sicknesses.